Okay, so it's not actually a handheld port of Dragon's Dogma. Capcom has announced Dragon's Dogma Quest for the PS Vita: A 2D "network compatible RPG" set in the Dragon's Dogma world. 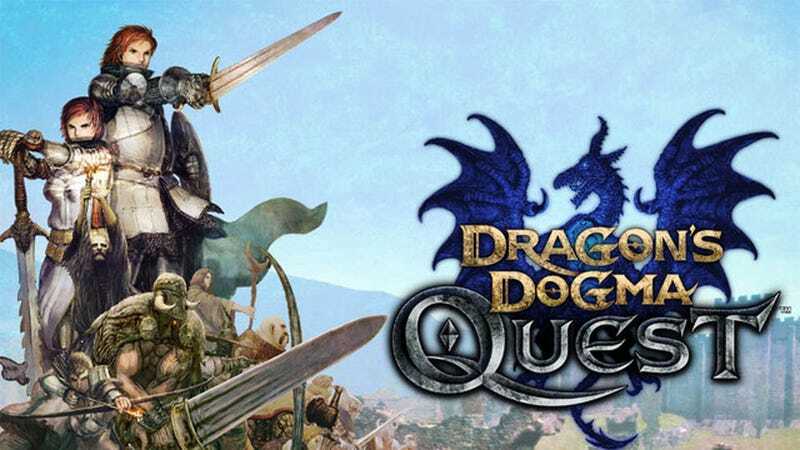 Dragon's Dogma Quest will be available free to download. Basic gameplay will also be for free, but there will be purchasable in-game items. In the game, players will once again take on the role of an "enlightened" heart-stolen protagonist on a quest to regain their heart from the dragon that made off with it. Various NPC characters from the original Dragon's Dogma will be making appearances throughout the game. The AI companion "pawns" from the original game will be present as well, although whether/how the pawn pimpin-er-trading system will work in the new game has yet to be revealed. The game is billed as a "network compatible RPG" which probably means, much like the original, it will likely be offline for the most part, with certain features that utilize network capabilities. Players will be able to create up to 9-member parties composed of their character, 4 of their own pawns and 4 friend party pawns. Pawns will have over 150 classes to choose from and change for increased customization and combat tactics. According to the developers, there is a "rarity" level to classes, which indicates that a) not all classes are initially available and b) there may be some sort of collecting feature. As for the combat, director Masanori Komine, in an interview with Japanese gaming magazine Weekly Famitsu, assured that while it would no longer be action-oriented like the original game, the new game would retain the core system of adjusting your tactics/party configuration depending on the creature you're fighting. Said Komine, "I believe the tactical side [of Dragon's Dogma Quest] is even richer than the action-based Dragon's Dogma." Currently I remain skeptically optimistic about Dragon's Dogma Quest. I did thoroughly enjoy the original Dragon's Dogma (I have yet to explore Dark Arisen), and while I am curious as to how the loss of the for-the-most-part-open 3D world will color my perception of the new game, I am looking forward to seeing how the developers are going to make it work. Dragon's Dogma Quest is scheduled for release in Japan this fall. No news on when to expect an international release. To contact the author of this post, write to cogitoergonihil@gmail.com or find him on Twitter @tnakamura8.